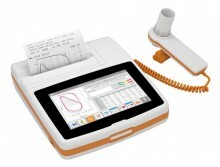 - Spirometry test: FVC, FEV1, IVC, MVV, PRE/POST Bronchodilator comparison with a wide range of selectable parameters. - Database up to 10,000 Spirometry tests or 900 hours of Oximetry recording coupled with powerful and flexible search services. - Optional function available: Oximeter with adult or pediatric finger probe. - Long life Rechargeable Battery. - Available with both DISPOSABLE or REUSABLE turbine flowmeter. - Bluetooth® 2.1 and USB Connectivity: Wireless or via cable Real Time test directly on your PC. - WinspiroPRO® PC Software provides Real Time Flow/Volume and Volume/Time curves with PRE/POST Bronchodilator comparison on your PC. Includes free online updates. - Pediatric Incentive for Spirometry with wide choice of pictures and animations. - Spirometry test after drug administration. Bronchodilator Reversibility, Bronchial Challenge with FEV1-response curve with protocols for both Methacholine and Mannitol. - Patient Trend Charts for easy follow-up. Search engine for instant access to database. Wide choice of communication protocols for integration with EMR. Click the button below to add the MIR SpiroLab Portable Desktop Spirometer Oximetry to your wish list.